Multi-Family Millions offers expert advice for investors who want to make the transition from single-family homes to more profitable multi-family units. Successful real estate investor David Lindahl shows you how to find troubled properties that are ripe for quick profits, how to fix or flip those properties, and how to re-sell at maximum value. With a proven step-by-step system for managing each stage of the process, this 272 page book shows you how to get started in moneymaking multi-family units, even while you work your day job. Dave Lindahl was a broke landscaper when he used a cash advance on his credit card to buy his first three-unit apartment house�and immediately reaped a $972 per month positive cash flow. Twelve months later he owned eleven multi-family buildings and had $10,000 per month in extra income. Today, he controls over $140 million in real estate. 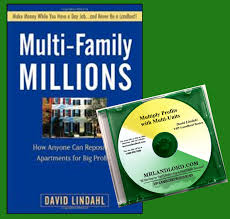 In Multi-Family Millions, Lindahl shows you how anyone can get started investing in small apartment houses and make great money doing it. You can do it on a part-time basis. Compared with single-family homes, multi-family properties hold much greater profit potential and allow you to earn more money on each deal you complete. There is also far less competition in the multi-family market. In addition, having more units under a single roof reduces your investment risk and offers higher long-term profits. The rewards of multi-family investing are obvious, but how can you benefit when you have very little time or money? Multi-Family Millions is the step-by-step guide that shows you how to get into the multi-family game and get out with big profits. It provides expert coverage of the most effective investing strategies and gives you guidance on every stage of the process from finding properties with great profit potential to buying, renovating, and reselling them for big money. No matter your level of investing expertise or experience, Multi-Family Millions gives you the perfect strategy for success, especially for investors with little time and little cash on hand. Whether you're an expert investor or just starting out, Multi-Family Millions reveals the proven strategies, tactics, and information you need to make big profits faster and easier than you ever thought possible. PLUS, receive a bonus CD where Jeffrey Taylor interviews Dave Lindahl as he reveals how to multiply your profits with multi-units (A $39 bonus value)! This special combo offer of the book Multi-Family Millions and bonus CD for only $39.95 with FREE shipping.